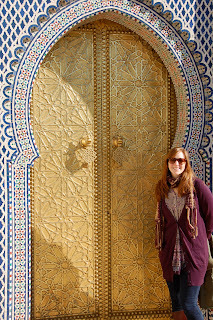 After a long drive north from the Sahara desert we made it to the final destination on our trip........the city of Fez - yeah, like the funny little hat that the Shriners wear. We had a jam-packed day of exploring the city with the help of a local guide who walked us through the bustling market and took us around a few artisan shops to check out the local handcrafts. Fez is old.............like 789 AD old. It was one of the former capitals of Morocco and the old walled part of the city ("medina") is a UNESCO World Heritage Site. 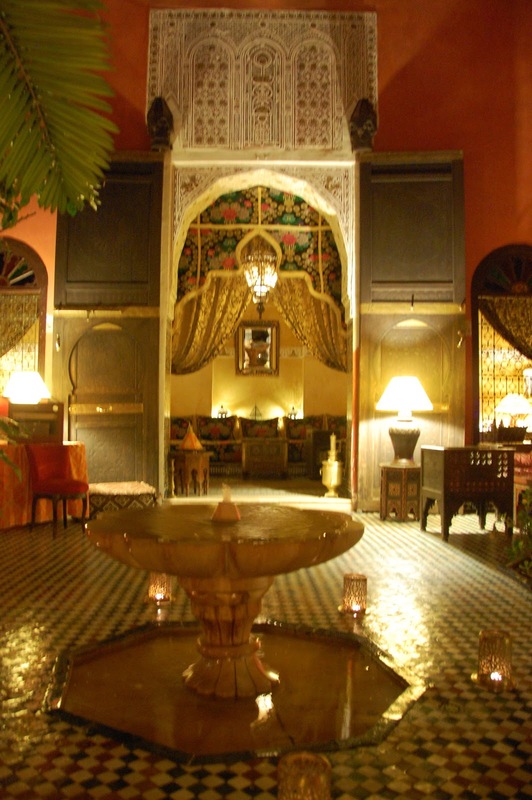 If you want an authentic Moroccan experience, you can't go wrong in Fez. 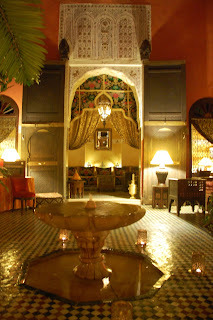 Our riad in Fez - another beautiful courtyard with a calming atmosphere. Let's see what's behind door number 7?! 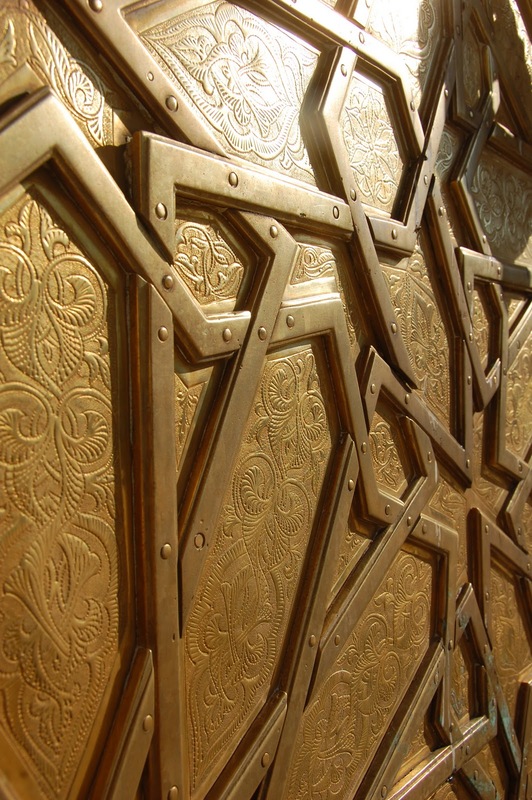 Love all of the brass detailing on the doors below. Aforementioned brass detail. Metalworking is a very traditional trade in Morocco, and Fez is one of the most famous cities for it. So this is what I pictured for a market in this part of the world.........sacks of beans, grains, and other dry goods. I love taking pictures in the markets. You can't go anywhere without running into dried figs and dates. Before this trip the only fig I knew came in a Fig Newton, which is not a cookie by the way.......it's fruited cake! Anyhoo the real figs look kind of gross (resembling shriveled up mushrooms or garlic or something), but they are delicious. 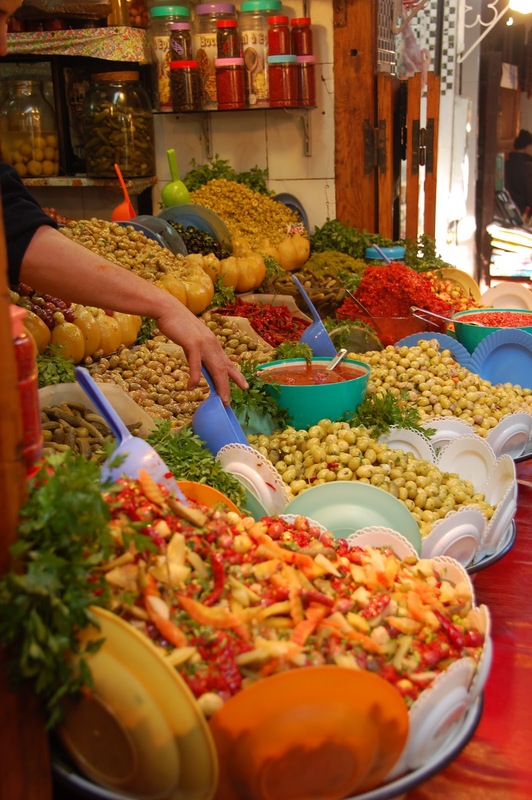 Like other Mediterranean cultures, there's no shortage of olives and other colorful vegetables. 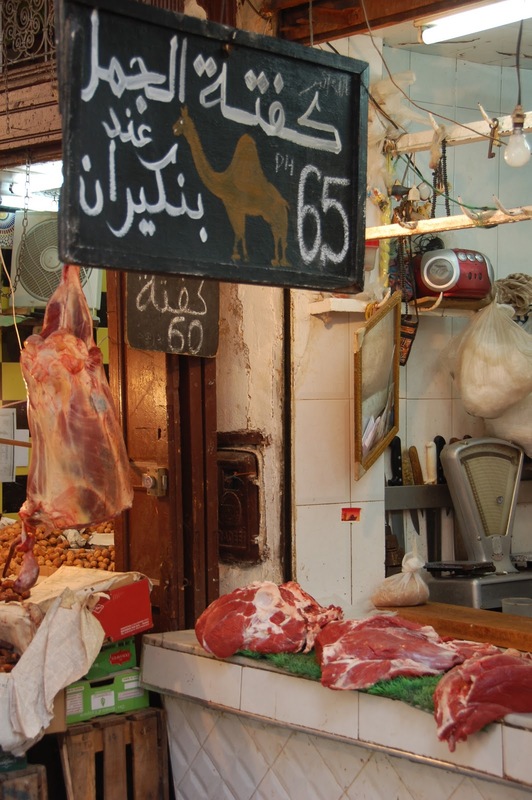 If you saw a grocery store in the States selling horse meat you'd think that was weird right? While it didn't seem to be very common, I did come across this camel meat butcher in the market. I didn't include it in the picture, but there was even a camel head hanging in front of the stand. After riding on a camel for 4 hours in the previous two days of the trip, I couldn't imagine eating my means of transportation. On the other hand I suppose it would be a waste to not use it. Cheesecakes, sort of. Pretty sure this is goat cheese. As mentioned before, the metal work is popular and we came across some jokers pounding out some copper cookware. Needless to say it's noisy work and doesn't sound as nice as a Caribbean steel drum. Light fixtures are very popular here as well. They make the metal shapes by hand and fit them with clear or colored glass or just have neat metal detail with no glass. With candles or electric bulbs these give a really nice effect. We visited this ceramic shop where people come and work as apprentices in all areas of the trade. It's very popular to learn a trade in addition to one's studies to keep the tradition alive and to supplement income. 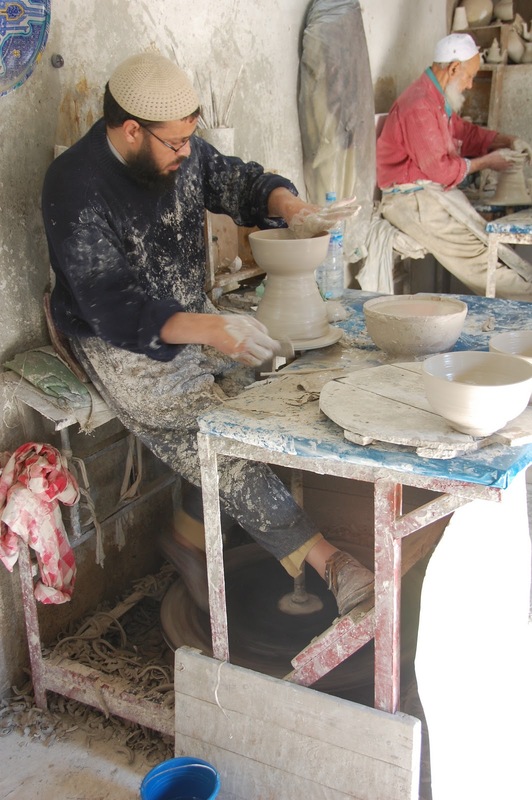 Another apprentice works on painting the intricate designs that are featured on all of the ceramics. Apparently these guys know all of the different patterns by name and just customize the color choice for each customer. This guy is assembling small ceramic tiles for a table upside down entirely from memory. The finished products are spectacular. Of course they were disappointed that we weren't ready to purchase a fountain or a huge patio table - even after they promised great shipping rates to the U.S.
Leather goods are also a huge craft and this is the tanning area of the old medina. They use all natural ingredients for the dyes.....including bird poo (the white vats in the upper left corner). This has to be one of the toughest jobs on the planet as these guys are literally thigh-deep in the vats all day, working the leather. After dyeing, the leather and other materials (this looks like wool) are laid out on rooftops to dry. The courtyard of an old madrasa, or religious school. One of my favorite views in Fez is through this "blue gate" where you can see the minaret from one of the mosques in the background. 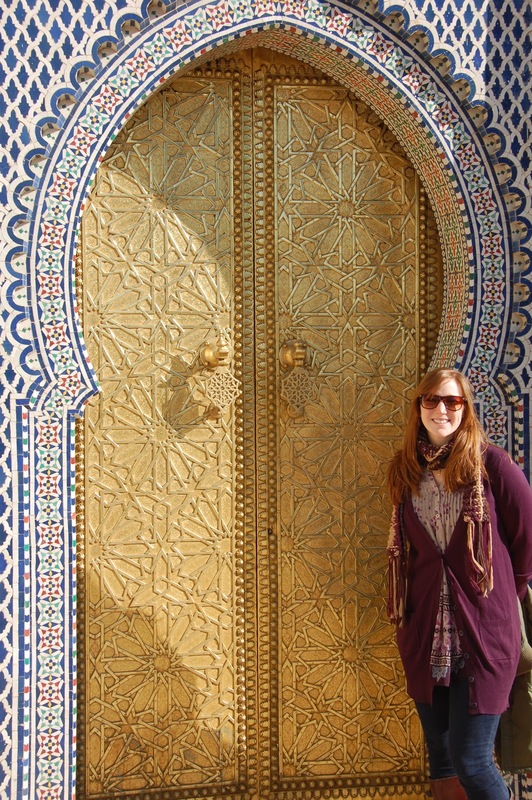 So Fez definitely didn't disappoint and neither did anywhere else we went in Morocco. If you're thinking about north Africa for a trip, which most people aren't these days.........then Morocco is an excellent option.